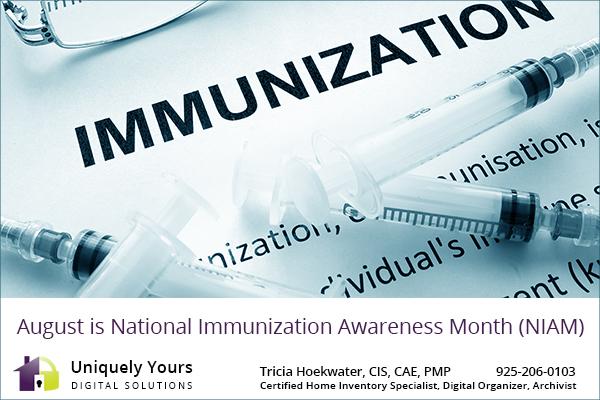 National Immunization Awareness Month (NIAM) is an annual observance held in August to highlight the importance of vaccination for people of all ages. Communities across the country use the month each year to raise awareness about the important role vaccines play in preventing serious, sometimes deadly, diseases across the lifespan. Catastrophe can happen in an instant. Take care of yourself…and what you have! A home inventory is important at any time – but more important than ever to do one now. I’m offering a 10% discount for any bookings confirmed by August 30, 2018. Contact me via phone at 925-206-0103 or by email uniquelyyours@outlook.com to schedule your inventory today.